Shaved-Ice Cave (known as Shaved Ice Cave in the PAL version) is the fourth level of World 4 in Paper Mario: Sticker Star. The area is an ice base and features no Comet Pieces or enemies. It serves as a sticker shop, containing a variety of Shiny, Flashy, and Big Shiny stickers. 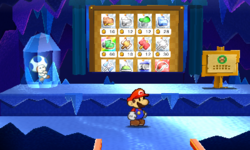 The shop's operator is a Blue Toad frozen in ice, but is able to sell stickers to Mario.